Dom Hemingway begins with an uproarious monologue, an ode to the titular safecracker’s anatomy delivered with profane bravado by an actor clearly relishing his role. After nearly two decades of playing the pretty boy – Dickie Greenleaf in The Talented Mr. Ripley, Errol Flynn in The Aviator, Alfie’s incorrigible womanizer, etc. – Jude Law comes into his own as a character actor in Richard Shepard’s (The Matador, The Hunting Party) screwball Brit crime comedy delivering a performance that is a bawdy beauty to behold. 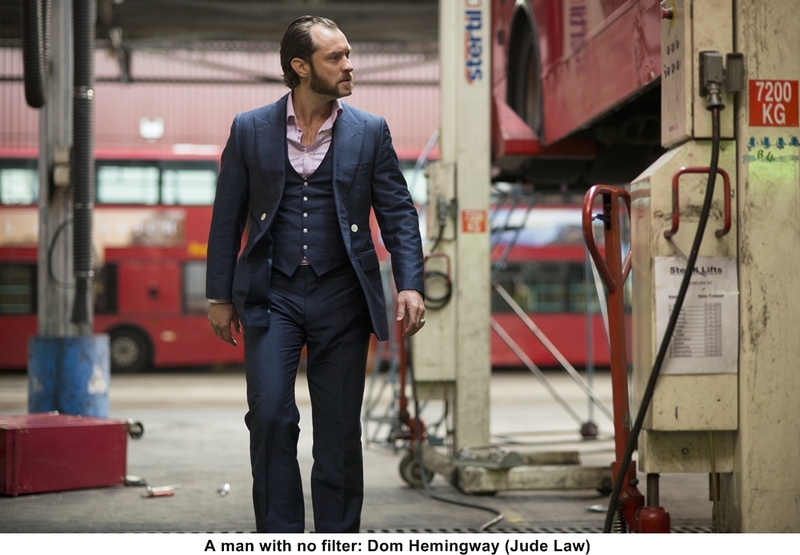 With 20 pounds added to his normally lean frame, terrible prosthetic teeth, a misshapen nose, horrible sideburns, a disco era wardrobe, and pugnacious gait, Law looks every inch what Dom Hemingway is supposed to be: a working-class criminal with flamboyant tastes and an even more extravagant personality. After serving 12 years in prison, he is eager to collect his best mate Dickie (the wonderfully deadpan Richard E. Grant) and head to France to collect money owed to him by crime boss Mr. Fontaine (Demian Bichir). He would also like to reconnect with his estranged daughter Evelyn (Emilia Clarke), who equates her father’s imprisonment with abandonment. Standing in Dom’s way, whether it’s in his interactions with Mr. Fontaine and Evelyn or in his attempt to slide back into a life of crime, is Dom himself. He is an alcoholic with a volcanic temper and absolutely no filter. Even in the most favorable situation, he finds a way to give offense, vulgarities and insults tumbling out of his mouth with zero regard for how they will be received. To be sure, Dom is hilarious. He is one witty, vulgar and weirdly erudite guttersnipe, a kick to watch, but clearly his own worst enemy.